An excellent story of naval warfare and high adventure in the early months of World War I. Based at Tsingtao, China, as part of Germany's East Asiatic Squadron, the EMDEN was detached from the squadron and allowed to go commerce raiding in the Indian Ocean, which she did extremely well. In addition, EMDEN bombarded Madras in India and sank two Allied warships at Penang on the Malay peninsula. Her exploits became world famous and caused the Allied powers to assign something like 80 warships to track her down. The Australian cruiser SYDNEY ultimately found and largely destroyed EMDEN when she stopped to destroy a wireless station and cable crossing at Cocos Keeling Island. However, that was not the end of the story. EMDEN's landing party escaped and made its way first to a port on Java and, from there, across the Indian Ocean to Saudi Arabia where the group, under Lieutenant von Mücke, avoided the British blockade in the Red Sea and then made its way up the coast of the Hijaz by land and by sea before finally reaching the railroad that would take the men to Damascus and finally to Istanbul. Hoyt tells this interesting and exciting tale very well in a clear, fast-paced style and a good eye for various subplots and story twists that make this a truly great story. 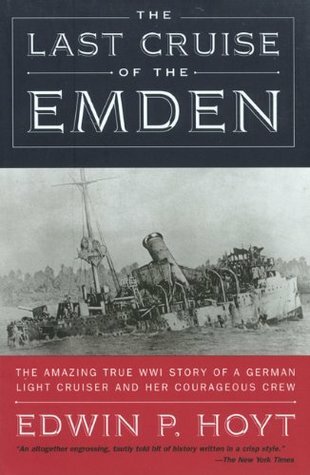 This is a very interesting story about the Emden, a German cruiser that terrorized the Indian Ocean during WW1. After capturing and sinking many ships it was finally sunk, but not before a shore party had escaped. This group had a separate set of adventures sailing to Sumatra, across the Indian Ocean to the Red Sea and finally making their way by boat and camel to where they could catch a train back to Germany. Quite harrowing stuff! Great book.. all of Hoyt's books are addicting and read very fast and intertaining. The Last Cruise of the Emden follows the adventures of the His Imperial German Majesty's ship by that name as it crisscrosses the Indian Ocean at the beginning of the First World War, capturing or sinking enemy merchant shipping. The latter half of the book tells the story of the Emden's landing party and their incredible voyage after being separated from the ship.It's a competent telling but it suffers from an excess of irrelevant detail. Hoyt's focus is on the daily life of the men in the crew, rather than on the immense events which give the story so much excitement. Thus, we have charming tales about the ship's cat and her four kittens (each named after one of the Emden's prizes); pranks played upon the surgeon; an examination of the bathing opportunities in port, etc. Somehow, the tone is just a bit too cute.The book also lacks any sense of larger scale. With the tight focus on the Emden itself, there's almost no discussion of the actions of the enemy forces seeking her and little examination of the effects of her cruise. The author states in his acknowledgements that he relied heavily on the first officer's account of the trip, and that bias seems to have carried over somewhat into this book.For a more comprehensive (and better written) version of the story, see Dan van der Vat's The Last Corsair: The Story of the Emden, which covers the same events but also includes information from British sources and fits the Emden's narrative into the larger picture of the war. As a History Buff, one has to find this an enjoyable read. Boring!! For WWI enthusiasts only. Edwin P. Hoyt - Edwin P. Hoyt was a prolific American writer who specialized in military history. He was born in Portland, Oregon to the publisher Edwin Palmer Hoyt (1897–1979) and his wife, the former Cecile DeVore (1901–1970). A younger brother, Charles Richard, was born in 1928. Hoyt attended the University of Oregon from 1940 to 1943.In 1943, Hoyt's father, then the editor and publisher of The Oregonian, was appointed by President Franklin Roosevelt as the director of the Domestic Branch, Office of War Information. The younger Hoyt served with the Office of War Information during World War II, from 1943 to 1945. In 1945 and 1946, he served as a foreign correspondent for The Denver Post (of which his father became editor and publisher in 1946) and the United Press, reporting from locations in China, Thailand, Burma, India, the Middle East, Europe, North Africa, and Korea.Edwin Hoyt subsequently worked as an ABC broadcaster, covering the 1948 revolution in Czechoslovakia and the Arab-Israeli conflict. From 1949 to 1951, he was the editor of the editorial page at The Denver Post. He was the editor and publisher of the Colorado Springs Free Press from 1951 to 1955, and an associate editor of Collier's Weekly in New York from 1955 to 1956. In 1957 he was a television producer and writer-director at CBS, and in 1958 he was an assistant publisher of American Heritage magazine in New York.Starting in 1958, Hoyt became a writer full-time, and for a few years (1976 to 1980) served as a part-time lecturer at the University of Hawaii. In the 40 years since his first publication in 1960, he produced nearly 200 published works. While Hoyt wrote about 20 novels (many published under pseudonyms Christopher Martin and Cabot L. Forbes) the vast majority of his works are biographies and other forms of non-fiction, with a heavy emphasis on World War II military history.Hoyt died in Tokyo, Japan on July 29, 2005, after a prolonged illness. He was survived by his wife Hiroko, of Tokyo, and three children, Diana, Helga, and Christopher, all residing in the U.S.